We especially enjoyed framing this tissue-paper thin James McNeil Whistler Etching, signed by Whistler and his printer, Thomas Robert Way, who added the number 100 to his signature. We matted the etching in a soft cream rag mat with an under mat of a light peach and protected the etching with a rag board backing. 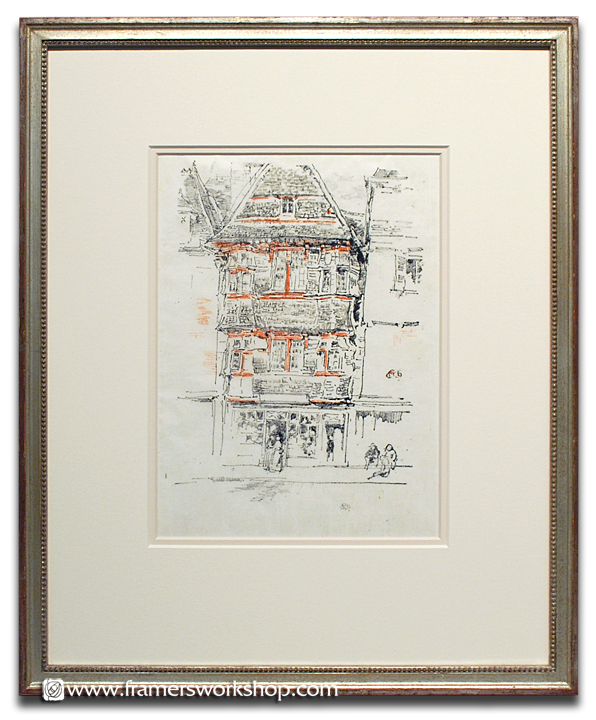 We selected a perfect Rhonda Feinman closed corner warm silver drawing frame to complete this preservation framing package. As usual, to record the provenance, we placed all accompanying documentation and previous framer's notes and sticker in a clear protective sleeve on the back of the frame.